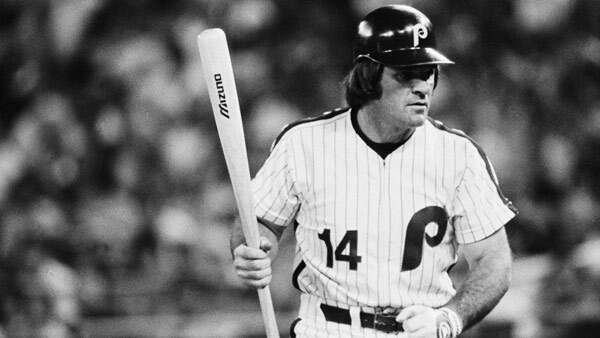 PHILADELPHIA (WPVI) -- Pete Rose is on the list of Philadelphia Phillies legend vying to make it on the Wall of Fame. Voting for the 2017 Toyota Phillies Wall of Fame inductee began Thursday afternoon. Fans can select their top three choices to become a Phillies Wall of Famer from the 10-man ballot of Phillies alumni. A first place vote is worth five points, second place three points and third place one point. The Phillies say the top five fan consensus choices as determined by total points will serve as the official ballot for a special Wall of Fame Selection Committee that will choose this year's inductee. Rose, baseball's all-time leader in hits, received a lifetime ban for betting on baseball in 1989. He denied gambling on baseball up until 2004. In December 2015, MLB commissioner Rob Manfred upheld Rose's ban keeping him out of the Baseball Hall of Fame. Rose was inducted in the Cincinnati Red's Hall of Fame last season. The winning candidate will be the 39th inductee into the Toyota Phillies Wall of Fame. Fans can vote by going to www.phillies.com/wof, now through Wednesday, March 15 at 5 p.m.